Our laying hens do not all look alike. And neither do their eggs. The type of eggs we produce are referred to as "ungraded". That means a carton of eggs from us might have eggs of different shapes as well as weights. 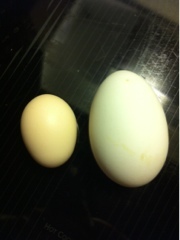 Sometimes we get eggs from the girls that are bullet shaped, sometimes round and sometimes wrinkly. Two extremes you are unlikely to see, as the tiny one looks too little in the carton and the big one causes the carton not to close. Farmer food.